Coordination between infant and adult is thought to be essential to infant development. However, the study is theoretically and methodologically grounded in a dyadic systems perspective and relational psychoanalysis. Our automated apparatus explores the micro-second timing of 4-month infant-adult vocal coordination to predict 12-month infant attachment and cognition. This work also further defines a fundamental dyadic timing matrix that guides the trajectory of infant development. Results: The Timing of Sound and Silence. Results: Coordinated Interpersonal Timing (CIT) at Age 4 Months. Results: CIT Rhythms at Age 4 Months Predicts Outcomes at Age 12 Months. Dialogical Nature of Cognition (Philippe Rochat). Face-to-Face Play: Its Temporal Structure as Predictor of Socioaffective Development (Daniel N. Stern). 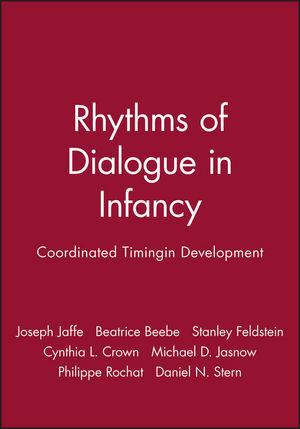 This book represents a test to the hypothesis that vocal rhythm coordination at four months of age predicts attachment and cognition at age 12 months. The findings show that high coordination can index more or less optimal outcomes, as a function of outcome measure, partner, and site. Comparison of mother-infant and stranger-infant interactions was particularly informative, suggesting the dynamics of infants' early differentiation from mothers.